Today, My Sister's Closet has reopened at a new location and we were asked if we'd be willing to lend some of our painting skills to the Non-profit organization's reopening. We had a really great time painting and serving in the community. 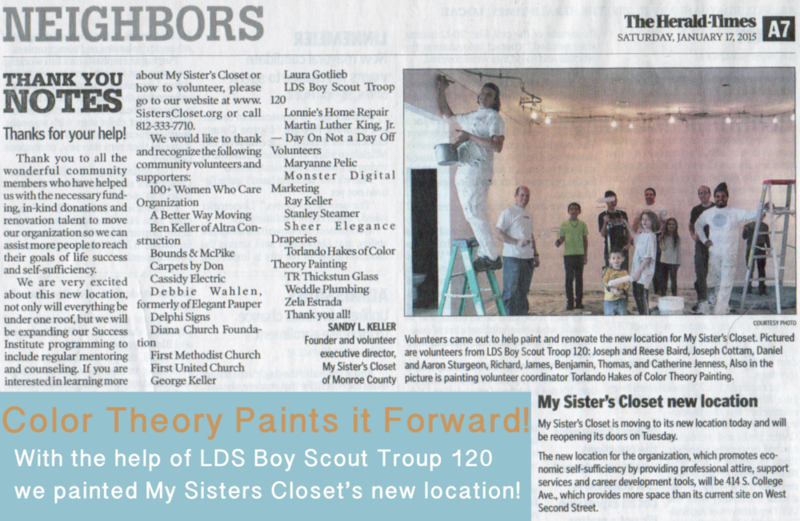 I invited along a few members from my church and they brought with them the LDS Boy Scout Troop 120. The boys needed to fulfill a merit badge requirement which was to paint a wall. So I brought a hand full of painting supplies and did a short workshop on painting and rolling just like a pro. They did a really great job! We are grateful to them and grateful for the opportunity to serve My Sister's Closet. My Sister’s Closet is a 501 (c) 3 non-profit organization established to provide free work force attire and Success Institute training to low-income and at-risk women pursuing employment. They offer new and gently used quality clothing available for purchase to the public. Inside you will find a wonderful variety of suits, pants, skirts, blouses, sweaters, and accessories to help you fit into your new career, prepare you for that important interview, and maintain a fashionable wardrobe within a budget. If you know an organization or family in need contact us because they may be eligible for our Paint It Forward Program. We only are able to do a few a year but we sure like helping where we can.